Fill your vase half to two thirds full with tepid water, this helps closed buds to start opening. Take care when un-wrapping a hand-tied bouquet as it is delivered in a water bubble to keep the flowers fresh. Arranging your flowers in chilled water should be avoided as this can significantly reduce the longevity of your gift. Do not put flowers in metal or aluminium containers, glass is ideal. Keep your flowers in a cool location, away from draughts, direct heat or sunlight. Strip off all excess foliage and leaves below the water level to reduce and harmful bacteria within the water. Bacteria can block the stem and stop the flowers taking up the water. Flowers like their stems trimmed. So, trim them, at an angle with a knife (rather than scissors) by an inch or so. When trimming stems, always cut at an angle of roughly 45 degrees; this increases the surface area allowing your flowers to absorb more water. If a Rose stars to droop at the head, re-cut the stem, wrap the head in paper to support it upright and plunge 5 cm of the stem into boiling water for about 30 seconds. Cut the stem again and place in deep cold water for two hours. Every "Hills florist" order is accompanied by a sachet of cut flower food which will encourage buds to open and help to prolong the life and beauty of your flowers. 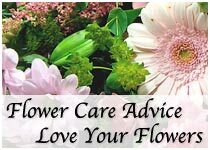 Top up regularly with water and flower food, removing any fading flowers. Ensure the floristry foam used in arrangements is moist and topped up daily; this helps to prolong the life and vibrancy of your arrangements. Although great care is taken to ensure baskets and containers used with our floral designs are water tight, We strongly recommend placing any fresh flower design on a mat to prevent damage to your surfaces. when watering an arrangement or basket some water may run off the design, We would therefore recommend taking your arrangement to the sink or other suitable place before watering. Candles used in floral arrangements are for decorative purposes only. Hill’s Florist can accept no responsibility for damage caused by candles to individuals, furniture or the home. Keep your plants or planted arrangements out of drafts and any direct sunlight. And when it comes to water it’s about finding the right balance - do regularly water but don’t over water. Because of the pot or container they come, in we recommend you place them on a mat to protect your surfaces.